Scarce Revolutionary War Era map of the Atlantic - the sort that would have been used by merchants, pirates, slavers, and smugglers. 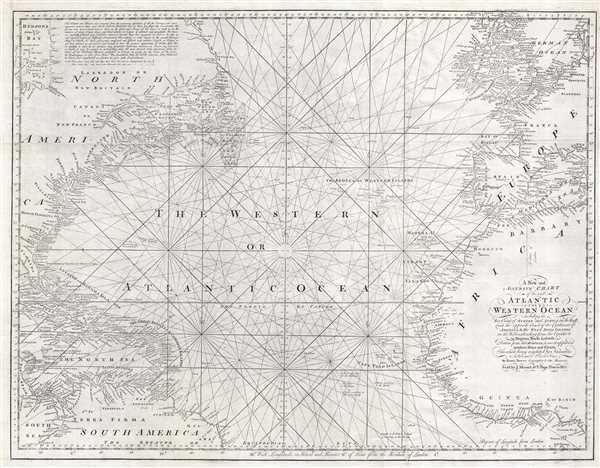 A New and Accurate Chart of the vast Atlantic or Western Ocean, including the Sea Coast of Europe and Africa on the East, and the opposite Coast of the Continent of America, and the West India Islands on the West; extending form the Equator to 59 Degrees North Latitude. A rare 1778 nautical chart of the northern Atlantic Ocean by then English cartographer Emmanuel Bowen. The map covers from, roughly, the Arctic Circle to the Equator and from western Florida and Cuba to Sardinia and Denmark. Inland detail is minimal although coastal cities are noted thoroughly. Shallow regions, particular the Grand Banks off Newfoundland, are defined by a combination of stippling and numeric depth soundings. Rhumb lines appear throughout. This map was introduced in the 1778 Mount and Page edition of The English Pilot, The Fourth Book. While inferior to the charts used by British naval officers, this map and its associated volume, were popular with merchant pilots, slavers, smugglers, and pirates active in the trans-Atlantic. Since this chart appeared just after the outbreak of the American Revolutionary War we can safely assume that Bowen recognized the opportunity afforded by the war for an affordable large format chart of the Atlantic. The extant of the chart, reach well into the coastlands of West Africa to the bight of Benin makes apparent its utility to those engaged in underhanded trades. Bowen derived this map from his own sources but also heavily references earlier French maps, most specifically the 1738 map of the western ocean issued for the Conte du Maurepas and the 1751 map of North America by J. G. B. D'Anville. It was drawn by Emmanuel Bowen and sold by Mount and Page of Tower Hill, London. There were only five subsequent issues of the Fourth Book following the 1778 edition in which this appeared. Not all subsequent editions contained this map and the book had smaller and smaller print runs as it declined in popularity throughout the latter part of the 18th century. Few examples of this map survive today and it rarely appears on the market. Mount, J., and Page, T., The English Pilot. The Fourth Book, (Mount and Page: London) 1778. The English Pilot, published from 1671 to 1794, was the brain child of John Seller (1630 – 1697). Seller, recognizing a lack of quality English made nautical charts, began to compile and engrave charts for a new maritime atlas as early as 1669. That same year he announced the publication of the English Pilot. The work was intended to be published in geographically specific volumes such that only the necessary maps need accompany a voyage. The English Pilot, The First Book, covering English waters, was published in 1671. Despite his claims, most of the maps in the first book were not English productions, but rather worn out Dutch map plates purchased as scrap and then retooled with Seller's imprint. Nonetheless, the work proved popular among merchant seamen and earned him the title 'Hydrographer in Ordinary' as well as copyright protection for 30 years. Seller failed to fully realize his grand scheme but it was picked up in earnest by other cartographers, including William Fisher, John Thornton, John Wingfield, Richard Mount and Thomas Page. Subsequent volumes followed including The Second Book, covering the Mediterranean; The Third Book covering African and Arabian coasts; The Fourth Book comprising the first British atlas exclusively dedicated to the Americas; The Fifth Book, a volume of practical Navigation; and The Sixth Book focusing on East Asian waters. The English Pilot was issued in over 40 editions with a print run exceeding 100 years. It was also pirated by George Grierson and published in Dublin under his imprint. It is one of the most important British atlases ever published. Very good. Minor verso reinforcement and repair along original fold lines. Else clean. Printed in two sections, joined by publisher. New York Public Library, Map Division, b13868971. OCLC 40122713.